This page will look to present inflation statistics in an interesting and interactive way. The problem with most statistics (interesting as they may be in table format), is the fact that it is not presented in an interactive or interesting way. We hope to change that and get users more interested in the numbers by presenting them in an interesting and interactive way. As a guide to our inflation heat map, the lighter blue colours indicate a lower level of inflation, and the brighter red the colour, the higher the level of inflation (see the Value Guide Bar bottom right of the graphics for a guide on the colours). Is excess money supply driving inflation? So for the last 26 months, the Western Cape has had the highest inflation rate of any of South Africa's provinces. And it is attributed to the growth rate in their property rent. See more regarding this in our Cape Town Property Bubble article. South Africa's inflation rate will in all likelihood increase slightly in coming months as additional inflation pressures starts to filter through to end consumers. These include increased taxes on fuel, increased taxes on alcoholic beverages and tobacco, a weaker exchange rate and stronger international oil prices which are pushing up fuel prices again. However all the current inflation drivers are due to factors outside of consumers control and the South African Reserve Bank (SARB) and its monetary policy committee (MPC) needs to take this into account when they meet again when setting the REPO rate which in turn affects the prime lending rate than banks borrow money to consumers at. While we said the aforementioned last month, the price of alcoholic beverages and tobacco has already increased sharply, and will increase even more for the month of April once prices are collected which includes the higher "sin taxes". Retailers of liquor and tobacco usually increase prices right after the budget speech and before the "sin tax" increases, then increase prices again in April with "sin taxes" and a bit more so that they can make more money. So we expect alcoholic beverages and tobacco to be one of the main drivers of inflation again next month. Below the main contributors to inflation in South Africa for March 2019. Alcoholic beverages and tobacco increased from 0,3 of a percentage point in February 2019 to 0,4 of a percentage point in March 2019. The index increased by 6,4% year-on-year. ​ Housing and utilities decreased from 1,3 percentage points in February 2019 to 1,1 percentage points in March 2019. The index increased by 4,5% year-on-year. So for the last 25 months, the Western Cape has had the highest inflation rate of any of South Africa's provinces. And it is attributed to the growth rate in their property rent. See more regarding this in our Cape Town Property Bubble article. South Africa's inflation rate will in all likelihood increase slightly in coming months as additional inflation pressures starts to filter through to end consumers. These include increased taxes on fuel, increased taxes on alcoholic beverages and tobacco, a weaker exchange rate and stronger international oil prices which are pushing up fuel prices again. However all the current inflation drivers are due to factors outside of consumers control and the South African Reserve Bank (SARB) and its monetary policy committee (MPC) needs to take this into account when they meet again when setting the REPO rate which in turn affects the prime lending rate than banks borrow money to consumers at. Interestingly inflation for all goods came in at 3% while inflation for services came in at 5.2%. So its clear inflation on goods consumers are buying is far less than the inflation rate of services consumers are using. The map below shows the inflation rate per province per month since that start of 2018. Once again the Western Cape has the highest inflation rate of any of South Africa's 9 provinces. So for the last two years, the Western Cape has had the highest inflation rate of any of South Africa's provinces. And it is attributed to the growth rate in their property rent. See more regarding this in our Cape Town Property Bubble article. Miscellaneous goods and services with 0.9 (or 20% of the total CPI in December 2018). Miscellaneous goods and services contains all the various insurance types such as household, vehicle insurance, medical aids etc. With inflation being driven down largely by the massive decline in the fuel price since the end of November, it is now in the middle of SARB's inflation target range. We still believe the South African Reserve Bank (SARB) monetary policy commitee (MPC) should never have raised interest rates in November 2018. Miscellaneous goods and services with 0.9 (or17.4% of the total CPI in November 2018). Miscellaneous goods and services contains all the various insurance types such as household, vehicle insurance, medical aids etc. For the last 22 months the Western Cape has had the highest inflation rate of any of the provinces in South Africa, and according to Statistics South Africa it is due to the high rental increases in the provinces. As rent is used as a proxy to estimate the cost of housing in the CPI basket. But with rental increases being heavily inflated in South Africa we believe the higher than usual inflation in the Western Cape is artificial in nature, but the worry is the fact that the Western Cape is one of the bigger provinces in South Africa and if their inflation rate is inflated artificially due to the rental bubble in the province it is likely that the overall CPI of South Africa is being overestimated, which has a significant impact on South Africa's monetary policy. See more regarding South Africa's November 2018 inflation rate here. So for the 21st month in a row the Western Cape has had the highest rate of inflation of any of South Africa's provinces. According to Stats SA the reason for this is due to the fact that Rent and Owners equivalent rent (or opportunity cost of staying in a house instead of renting it out) and its inflation, in the Western Cape is far greater than it is any of the other provinces, and this keeps driving the province inflation higher than the national average and the other provinces inflation. The interactive map below shows the inflation rate per province in South Africa per month from the start of 2018. And once again, the Western Cape has the highest rate of inflation of any of the provinces in South Africa. That is the 20th month in a row in which the inflation rate of the Western Cape is higher than that of any of the other provinces in South Africa. We sent a query regarding this to Statistics South Africa and will update readers once a response on the matter has been received. The inflation rate for goods for September 2018 came in at 4.8% year on year while the inflation rate for services came in at 5.2% year on year. This is largely due to the fact that services tend to have "sticky prices", whereas goods tend to experience "sticky prices" less often. Sticky prices refers to the phenomenon of prices not being prone to movements, especially price declines. For example the prices of goods will fluctuate and in some cases decline, as competition and over supply can force prices down as retailers or businesses try to get more business and to sell their stock on hand. On the other hand, those offering a service, for example a haircut, will hardly ever lower their price, but will be quick to increase their prices should their input costs such as electricity, water or rent go up. The interactive map below shows the inflation rate per province in South Africa per month from the start of 2018. And once again, the Western Cape has the highest rate of inflation of any of the provinces in South Africa. That is the 19th month in a row in which the inflation rate of the Western Cape is higher than that of any of the other provinces in South Africa. The interactive map below shows the latest inflation rate per province up to June 2018 for all South Africa's provinces. And what has become a familiar pattern, the Western Cape had the highest annual rate of inflation in June 2018, with its inflation rate sitting far above the national official inflation rate of 4.6%. And this is the 17th month in a row that the Western Cape recorded an inflation rate higher than that of any of the other provinces. Some form of bias being built up into the Western Cape's numbers? We wonder. Is it the the type of outlets or products that they collect in this province that is causing this? It is clear from the above that the Western Cape's inflation rate is far greater than the national average of that of any of the other provinces in South Africa. Question is whether this is a true and accurate reflection or is there something amiss with the numbers for the Western Cape as published by Stats SA? 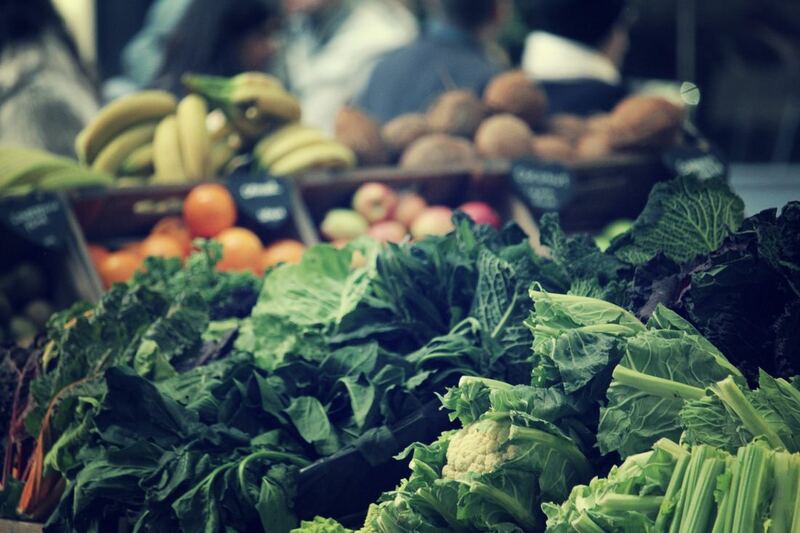 The Western Cape has had the highest inflation rate of any province in South Africa for the last 16 months. Surely this has to raise some form of suspicion or alarm with the Statistics agency publishing these numbers? We will ask them a few questions regarding this and post their response here as soon as we receive it. The graphic below shows the latest inflation figures per province in South Africa. The colours of the map has been updated again. And the pattern as has been observed in recent months continues, in which the Western Cape is the province with the highest inflation rate in South Africa. So is the water crisis in Western Cape leading to higher levels of inflation in the Western Cape? Or do Western Cape consumers tend to buy goods and services which prices are more prone to price increases? And why is Gauteng's inflation rate always to close to the inflation rate of South Africa as a whole? Well due to the significant weight of Gauteng (around 35% of total inflation basket is made up by Gauteng) in the South African inflation basket, it is not surprising that the movement and levels of inflation experienced in Gauteng is close to that of South Africa as a whole, as Gauteng is the main driver and contributor to inflation in South Africa. 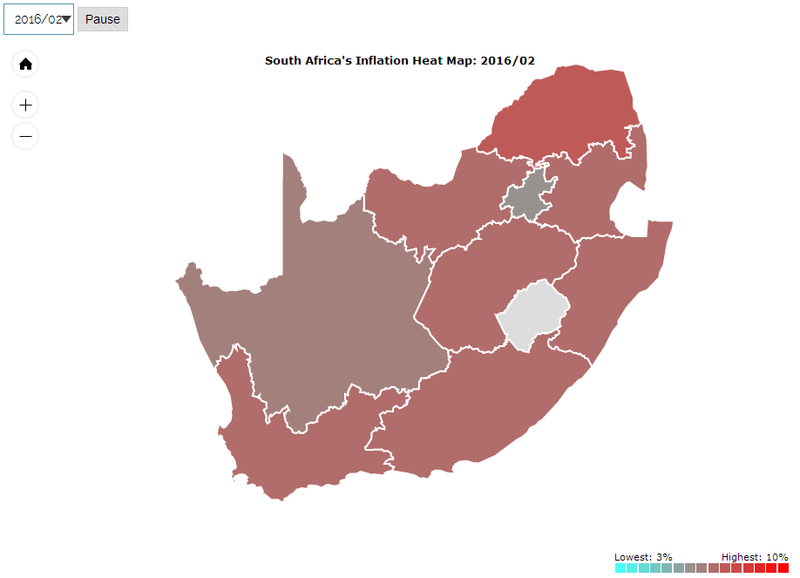 The animated, interactive map of South Africa shows South Africa's inflation rate per province over time. We have decided to change the colour scheme up a bit compared to our last update a month ago. Interesting to note is the fact that Western Cape continues to have by far the highest level of inflation of all the provinces in South Africa. In last months update we published a table showing the inflation rate of all the provinces as well as the overall level of inflation in South Africa. See the table below showing the year on year inflation rate for all South Africa's provinces. Below the table an image version of the table showing graphically how much higher Western Cape's inflation is compared to the rest of South Africa. The question is what is driving inflation upwards at a rate much faster in Western Cape than the rest of the country? While it is not uncommon for a province's inflation to far outstrip that of others for a month or two, we noted last month that Western Cape's inflation for 2017 so far is far higher than the other provinces. So this is not a once off event. Consumers in the Western Cape are truly experiencing price increases a lot more than the rest of South Africa. Guess that's the price they have to pay for the natural beauty that surrounds them. The image above uses the data in the table shown above to graphically represent the inflation rates per province, as we know a lot of our readers prefer looking at images and graphics instead of tables (dont worry so do we). The image clearly shows on the colour scale that the Western Cape's inflation rate is far above that of the rest of the provinces in South Africa. 18 October 2017: Inflation spikes as meat prices rise. The interactive map of South Africa above shows the inflation rate per province in South Africa for each month as published by Statistics South Africa, Based on the latest CPI data, inflation is highest in the province of the Western Cape and lowest in Mpumalanga, while the inflation rate of Gauteng is very similar to the overall inflation rate of South Africa, and this is due to the fact that Gauteng carries almost a third of the weight of the CPI basket. The latest official CPI for September 2017 is sitting at 5.1% (a spike from the 4,8% the month before). And based on the numbers this is largely driven by strong meat price increases. And this is secondary inflation effects from the drought SA experienced in its recent past. This is a prime example of Cost push inflation. Inflation is being pushed up by cost pressures, due to limited meat supplies, and not due to increased consumer demand. We hope the South African Reserve Bank takes this into account when meeting to set interest rates. Consumers should be very happy with the latest inflation figures published by Statistics South Africa. It shows South Africa's inflation slowed to just 4.6% year on year (I.e comparing prices in July 2017 to July 2016 yielded a price increase of 4.6%). It is one of the lowest rates of inflation that South Africa has experienced in its recent past, and it paves the way for the South African Reserve Bank (SARB) to reduce interest rates a little more to assist struggling South African consumers and the weak economy. (Though lower interest rates might lead to a weaker Rand). But it has been so weak over the years thanks to Zuma's midnight cabinet reshuffles and weekend special ministers we doubt a lower interest rate will have a significant impact on the Rand at this stage. ​Below South Africa's inflation rates over time on a interactive map graphic showing the inflation per province over time. The interactive map below shows the year on year inflation rate of all the provinces in South Africa (All Urban Areas-All Items per province). The lighter green colour shows lowest levels of inflation and the darker the colour gets the higher the level of inflation present in that specific month and province. The image on the right shows the inflation heat map for August 2015. As can be seen from the image, the overall level of inflation for all provinces are pretty low (based on their colours). But an inflation storm was starting to brew in South Africa. This was mostly due to the severe drought being experienced in South Africa. The drought led to South Africa importing more agricultural products, at a higher price than what we can produce it for locally (weather permitting). This leads to higher food prices, increased feed costs (since some of this has to be imported now) for livestock, and will filter through to higher meat prices as the cost of rearing these animals become higher. Six months down the line and the inflation picture on the right has changed significantly. The map has moved from light blue (indicating low inflation) to light brown to red (indicating significantly higher levels of inflation). When inflation moves so strongly, and so quickly, its hardly ever caused by increased demand (Demand Pull Inflation). It is more than likely caused by external shocks (Cost Push Factors). Demand pull is a slower and more gradual continues increase in inflation, as overall demand tends to move at a slower rate than sudden price shocks (for example, oil price shocks, exchange rate volatility etc). This brings us back to our blog post the other day in which we contended that the South African Reserve Bank is raising interest rates more to protect the Rand than to control inflation. The inflation moves experienced now are not caused by increased demand, but by factors beyond the Reserve Bank's control (like the drought in South Africa). Below the interactive inflation heat map from January 2014 to February 2016.